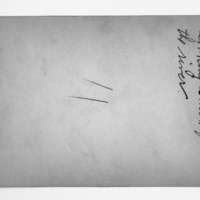 Edward Bennett labeled the title of this photograph on the verso of the photographic print. This view from 1913-1915 looks toward the future site of Grant Park, and it shows the narrowness of Michigan Avenue prior to the development of the bridge and Wacker Drive by 1920. In addition, this photograph documents the approximate the site of the former Fort Dearborn. 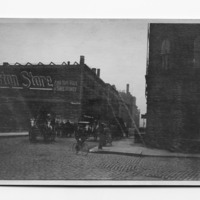 By the early 20th century, this area of Chicago was a warehouse district located between the business center to the south and the Chicago River. The intersection appears to be Michigan Ave. and River Street (see Randall, History of Chicago Buildings, p. 213). On the brick street and intersection are shown a cyclist and a couple of horse-drawn freight wagons. On a store on the east side of Michigan is an advertisement for the Boston Store. This is one of series of views taken in preparation for design of Wacker Drive and the Michigan Avenue bridge. Bennett, Edward H. (Edward Herbert), 1874-1954, “Michigan Avenue -- looking south from the river,” Digital Collections - Lake Forest College, accessed April 26, 2019, http://collections.lakeforest.edu/items/show/2036.